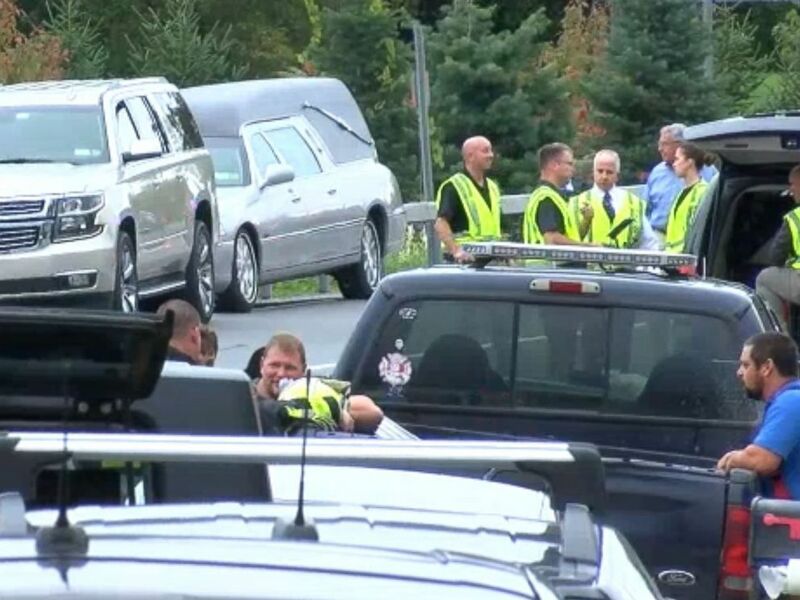 Twenty people were killed in a "horrific" limousine crash in upstate New York in what investigators are calling one of the "most deadly" transportation accidents in years. 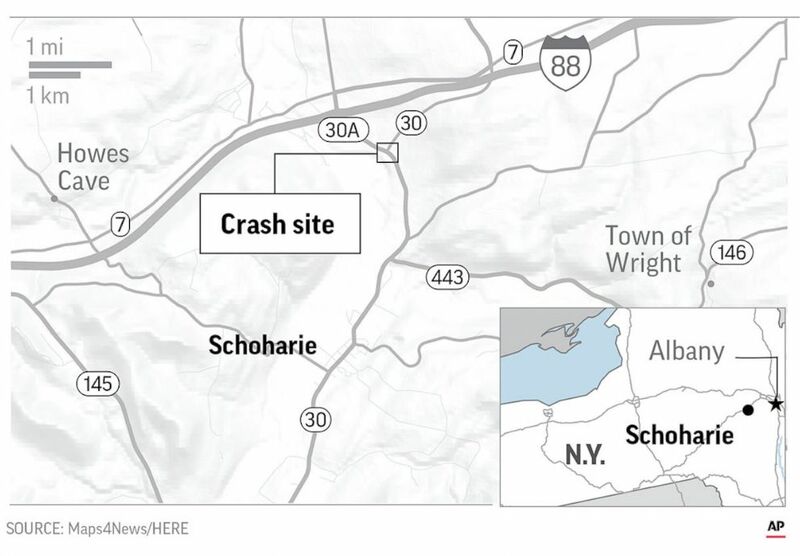 Eighteen of the victims were in a 2001 Ford Excursion limousine, which crashed into a parked 2015 Toyota Highlander in a parking lot in Schoharie, a town about 40 miles away from Albany, authorities said. Two of the victims were pedestrians, according to the New York State Police. "Twenty fatalities is just horrific," said Robert Sumwalt, chairman of the National Transportation Safety Board, which is investigating the crash. "This is the most deadly transportation accident in this country since February 2009," Sumwalt said, referring to the Colgan Air crash in Buffalo in which 50 people died. 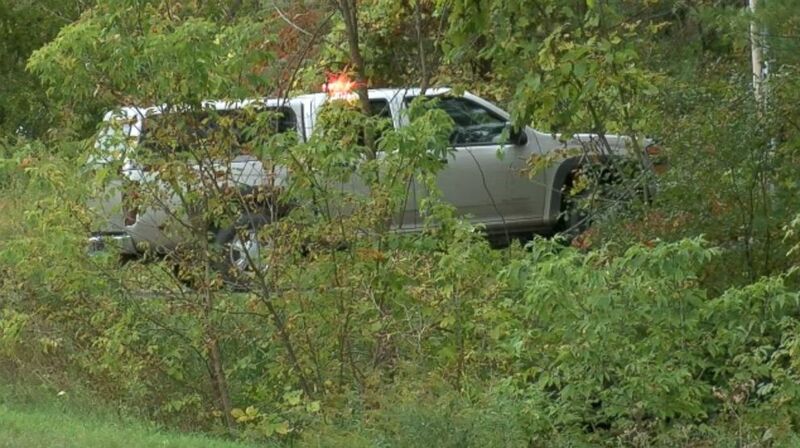 Multiple deaths are reported after a limousine accident in upstate New York near Albany on Oct. 6, 2018. All of the victims were adults, according to the New York State Police. They were not identified because police were still notifying the victims' relatives. Valerie Abeling, who says her niece and her husband were in the limousine, said it was on its way to a birthday party. She said her niece, Erin Vertucci, 34, and Shane McGowan, 30, were newlyweds. Abeling said her daughter was invited to attend the birthday celebration but didn't go. "Our lives have been changed forever," she told the Associated Press. Barbara Douglas, who told ABC News she lost relatives, too, said it was a surprise birthday party for her youngest niece. "I had four nieces. They are all dead. They were in there," she said, without naming them. An employee at the Greater Amsterdam School District was also killed. In a statement, the district said it is withholding the person's name until relatives are notified. The crash occurred just before 2 p.m. Saturday, at the intersection of State Route 30 and State Route 30A, police said. 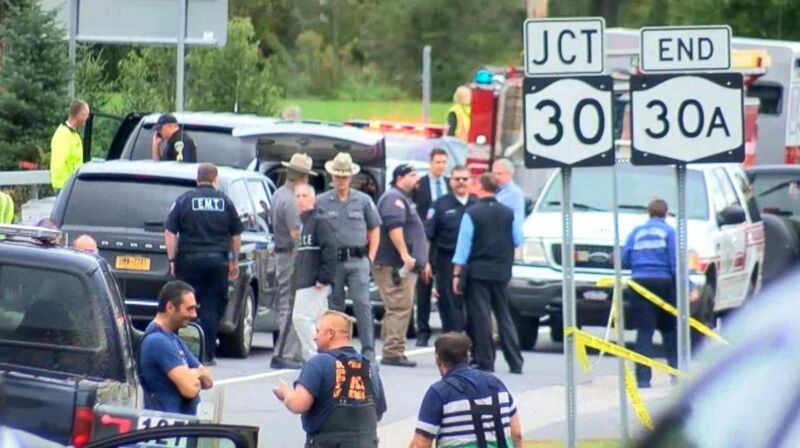 Chris Fiore, first deputy superintendent of the New York State Police, said the limousine, which was headed southwest on State Route 30, failed to stop at the intersection. The speed limit on that road is 50 mph, but it was not immediately clear how fast the Excursion was going, Fiori said. The limo went through the intersection and crashed into the parked Highlander in the lot of an Apple Barrel Country Store and Cafe. That's where the vehicle struck two pedestrians, officials said. "There was a horrific accident in front of our business today," the company posted on its Facebook page Saturday. "Our hearts and prayers go out to everyone that was affected by the events of today," the company added. The NTSB and the State Police will conduct separate investigations but will work together, Sumwalt and Fiore said at a news conference Sunday afternoon. "We look at everything," said Sumwalt of the upcoming investigation. "We cast a very broad net to see what's out there. We conduct very thorough investigations." Earlier in the day, the NTSB tweeted that it was sending a "go-team" to investigate. Its lead investigator on the scene will be Pete Kotowski, and the team will be there about five days, Sumwalt said. In response to a reporter's question about a toxicology test on the driver, Fiore said part of the investigation will be an autopsy on the driver. Also part of the probe will be whether the driver and the passengers were wearing seatbelts. Fiore said, according to New York State law, the driver and passengers in the front seat are required to wear seatbelts, while occupants in the back are not. "I join all New Yorkers in mourning these deaths and share in the unspeakable sorrow experienced by their families and loved ones during this extremely difficult time," he said in a statement. New York Sen. Chuck Schumer tweeted: "May God bless the families who lost loved ones." Heartbroken to learn of the terrible accident in Schoharie. May God bless the families who lost loved ones, as well as my dear friends from Schoharie emergency service agencies who responded. State Police set up a phone line for relatives of the victims. Those for looking for assistance can call 1-877-672-4911. There have been other deadly limousine accidents in recent years. In 2013, a limo in San Francisco caught fire and passengers were trapped without an accessible exit. The next year in New Jersey, a limo bus carrying actor Tracy Morgan collided with a tractor-trailer; one passenger died and Morgan and another passenger were injured. And back in 2005, a 7-year-old girl in a wedding limousine died in Long Island, New York, after a drunken driver plowed into them head-on. The limo driver was also killed in the crash. In 2015, the NTSB, at the urging of Schumer, made a commitment to investigate more stretch limousine accidents on a case-by-case basis. ABC News' Ben Stein, Joshua Hoyos and Aaron Katersky contributed to this report.